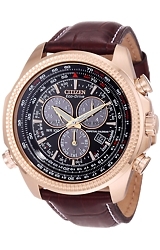 Introducing Citizen's all new analog Flight Computer Pilot's Watch with a Perpetual Calendar, Alarm and 1/20th split second Chronograph. This new watch is one of the finest, most technologically advanced, watches ever made, ideal for pilots and anyone wanting a full featured trimepiece. 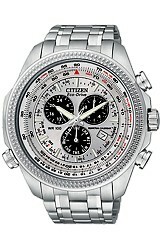 This Perpetual Calendar, Alarm, Chronograph Flight Watch features Citizen's Eco-Drive "battery free" quartz movement. You get all this functionality, accuracy and durability and NEVER NEED TO CHANGE THE BATTERY!